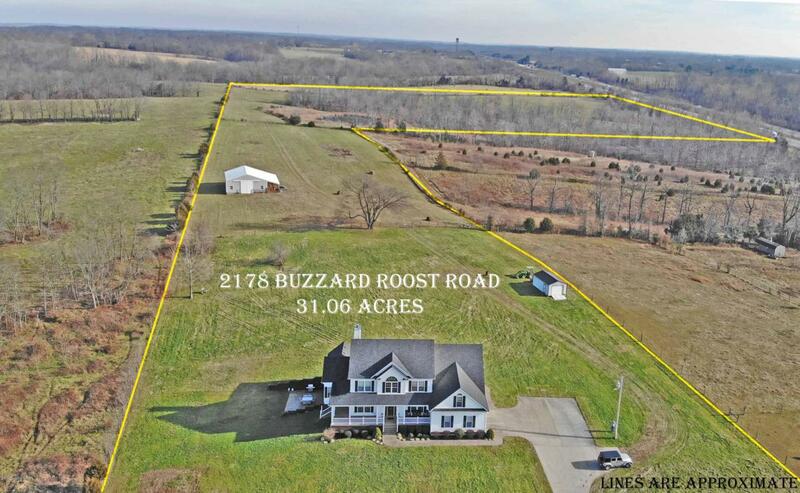 Loads of Space and 31+ Acres!! Here it is. Amenities Galore! This Amazing Home has all the space you could want! First floor features include an Entry Foyer, Great Room, Large Country Kitchen, Formal Dining, Formal Living/Study, Master Bedroom Suite w master Bath, Walk-in closets, 1st Flr Laundry, a Half Bath and a 857 sf Oversized Garage with Workshop area. The 2nd floor features 4 additional Bedrooms, a Huge Hobby Room, Bonus Room, Balcony Area and a 2nd Full Bath. The Lower level has a Huge Family Room that walks out to the patio area, a 3rd Full Bath, a Large Storage area and a huge Safe Room under the porches.Exterior features include a 40X48 Metal Barn with Shed, a 38X45 Stock Barn, a pond, fenced pastures and concrete Drive. See Photos! Call NOW to view this Amazing Property!